National Freedom Front leader Wimal Weerawansa requested from Speaker Karu Jayasuriya yesterday in parliament to accept five NFF MPs including him as an independent group since they have severed all their connections with the UPFA. Speaker Jayasuriya said that he would refer the matter to the party leaders’ meeting scheduled for today and will inform the outcome to the House. MP Weerawansa made his request soon after House commenced sittings yesterday. I have handed over the same request in writing to you months ago. We have informed you that the NFF MPs no longer have any connection with the UPFA and would act as an independent group. You stated that the matter would be taken up with UPFA leaders and let us know of the result. However, so far we have not been informed of the result. This has deprived us of our rights. I request you to take action necessary to enable us to function as an independent group in this Parliament. We have a right to be independent. Please give our rights. Speaker Karu Jayasuriya: I informed the UPFA leaders of the letter and the issue as soon as I received it. The UPFA leaders have written back to me and said that they had not been informed by your party of any decision to be independent in the House. You should inform them too of our decision to break away from them. MP Weerawansa: I too got a copy of the letter sent to you by the UPFA. That letter does not say that we have not conveyed to the UPFA our standpoint but that they could not accept it. The matter is simple. I state that we have broken the ties. They say it is unacceptable. It does not matter whether they would accept it or not because we act independently. You can make a decision and that could be done without depending on the UPFA letter. Speaker Jayasuriya: They need you to make a public statement to the effect. 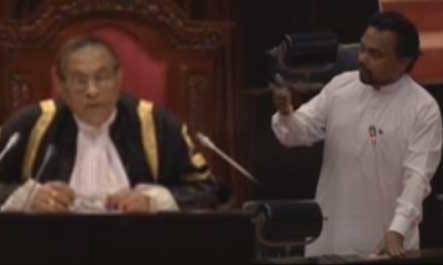 MP Weerawansa: I stated it here in this chamber. For god’s sake is parliament not a public place? The Speaker: There is no need to tell the gods. Tell it to this House. MP Weerawansa: I have already told this House. Then I stated it in my letter too. Now I tell the entire nation that I am no longer a UPFA Parliamentarian. We have severed all our relations with the UPFA. Please accept us as an independent group. Should I say Amen at the end of this, honourable Speaker? The Speaker: No…There is no need for that. What you said was more than enough. I will discuss this with the UPFA and inform the House of my decision. MP Weerawansa: There is no need to talk with the UPFA. You can give your decision. The Speaker: Let me do my job. MP Weerawansa: The way you do it is wrong. The Speaker: I have a right to speak. I need to consult legal experts in this regard before giving my ruling. Let me do that. UPFA MP Bandula Gunawardena: MP Weerawansa is not a member of the UPFA. Therefore no problem will arise by accepting his party as an independent group. Minister Rauff Hakeem: I too once faced with a similar problem during the last Parliament. We contested under the UNP ticket. When we demanded to be considered a separate group that request was turned down saying that we contested from the UNP. Then we accepted it. I was deprived of the chance of raising issues in the Chamber as a party leader. It was the last government which set that precedence. Leader of the House and Higher Education and Highways Minister: It is only today MP Weerawansa made his intention public. When he informed us of his intention I told him to state it in Parliament, but he did not do so then. MEP leader Dinesh Gunawardena: We too were in Parliament then. We could get the Hansard copy of what had been said on that day. I got up to speak on what Minister Hakeem said. The then Speaker Chamal Rajapaksa stated that leaders of each party should be recognized. Minister Hakeem’s issue is older than that. Vasudeva Nanayakkara: We contested under the betel leaf symbol. We agreed to do so under the leadership of Mahinda Rajapaksa. Thereafter some got together and wrote false instruments and deprived us of our rights. We hope that our rights and the rights of those who voted for us would be protected. We have forwarded this issue to the International Parliamentary Union too. The Speaker is the Chairman of that union. The Speaker: No…I am not the chairman. MP Nanayakkara: This matter could be sorted out through a discussion with the Speaker. The Speaker: Of the time allocated for the UPFA, 55 per cent or 60 per cent is given to the Joint Opposition. We have accepted Dinesh Gunawardena as the leader of the Joint Opposition. Today MP Weerawansa for the first time made a statement in the chamber expressing his party’s wish to be independent. I would take this issue at party leaders’ meeting and let you know.